The testing schedule in the Chicago public schools varies by school and area. The testing schedule in the Chicago public schools varies by school and area. 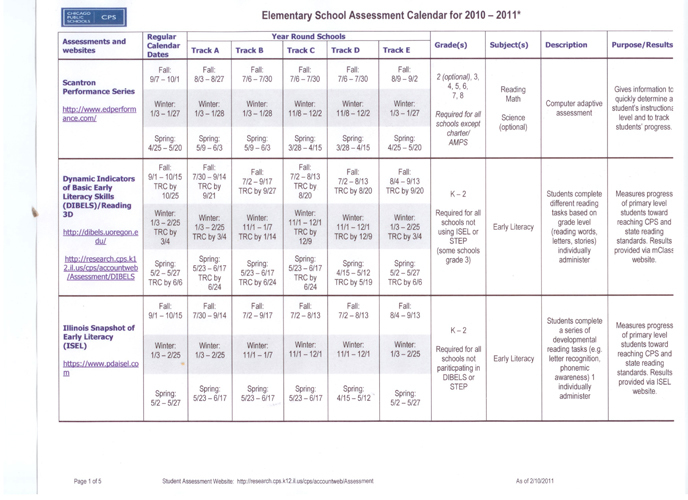 What follows, though, is a typical schedule, as specified on the CPS research and evaluation website. To know exactly which tests will be administered at their school, parents need to ask the principal. In some elementary schools students take more tests. Some schools, depending on the area, administer additional standardized tests as often as every five weeks. These tests and the testing schedule are not on the Board’s research and evaluation website. Some schools administer the MAP, KLT, area-created 5-week assessments, Riverside (aka AchieveData or DataDirector, a 5-week area assessment), or other 5-week assessments created by other outside vendors, in addition to the above elementary school schedule. The testing schedule varies by school and area. Chief Area Officer Rick Mills determined a schedule for the schools in Area 26. His plan calls for students to take 63 standardized tests before they take the two-day PSAE in the spring of their junior year.